We’d love your help. Let us know what’s wrong with this preview of The Transatlantic Conspiracy by G.D. Falksen. The year is 1908. Seventeen-year-old Rosalind Wallace’s blissful stay in England with her best friend, Cecily de Vere, has come to an abrupt end, which is fine with Rosalind. She was getting tired of being high society Cecily’s American “pet.” Her industrialist father is unveiling his fabulous new Transatlantic Express, the world’s first underwater railway. As a publicity The year is 1908. Seventeen-year-old Rosalind Wallace’s blissful stay in England with her best friend, Cecily de Vere, has come to an abrupt end, which is fine with Rosalind. She was getting tired of being high society Cecily’s American “pet.” Her industrialist father is unveiling his fabulous new Transatlantic Express, the world’s first underwater railway. As a publicity stunt he has booked her on the maiden voyage—without asking. Rosalind is furious. But lucky for her, Cecily and her handsome older brother, Charles, volunteer to accompany her home. To ask other readers questions about The Transatlantic Conspiracy, please sign up. Oh, I do love a story about bad girls and The Transatlantic Conspiracy is quintessential. Rosalind’s own words best define her when she explains to Alix, “I drive motorcars and I’m a suffragist, so my reputation is already a bit uncertain.” Their mutual friend Cecily not only tinkers with clocks, but has been known to write “strongly worded letters” to express her displeasure or disappointment. Embarking on the maiden voyage of the underwater railway, Alix is quick to confirm that her traveling Oh, I do love a story about bad girls and The Transatlantic Conspiracy is quintessential. Rosalind’s own words best define her when she explains to Alix, “I drive motorcars and I’m a suffragist, so my reputation is already a bit uncertain.” Their mutual friend Cecily not only tinkers with clocks, but has been known to write “strongly worded letters” to express her displeasure or disappointment. Embarking on the maiden voyage of the underwater railway, Alix is quick to confirm that her traveling companions both know “how to give a swift quick and a good stab” (with a hatpin). Perhaps I should mention that this steampunk story begins on May 25, 1908. My first book from this fantastical, science-fiction subgenre complete with advanced machines and modern technology. It did not disappoint. Rosalind is quite accustomed to traveling alone, despite being female and seventeen years old. She has every confidence in her father’s perpetually advancing railways, whether it be traveling above water on an impossibly long bridge or seven days underneath, riding a train through the ocean from Germany to New York. She may not cherish her reluctant role as a “pawn in her father’s advertising campaign”, but she has never felt afraid. Until now. From the beginning, with Cecily and sibling Charles unexpectedly announcing plans to accompany Rosalind to America, to feeling inexplicably unnerved at the station, Rosalind is overcome with unease as she boards. A strange skepticism settles; people seem to smile around secrets tucked safely away. Charles disappears. Two passengers are murdered. It is only the second day. 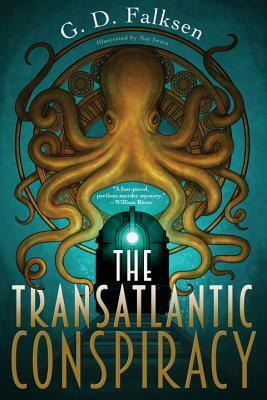 Fully engaging with twists and turns, sneaky surprises, loyal friendships and levity; The Transatlantic Conspiracy was a fascinating foray into steampunk. There is not a single giant squid in the whole damn book. What a gyp. Aside from the underwater train there isn't even any fantastic or sci-fi element -- its just a weak historical mystery with underdeveloped characters. Very disappointing. This book started off as a contradiction for me, and continued as such through the whole thing. The voice is middle grade, but the characters are all older teens, which makes this a YA novel. The main character is a feminist who values education and abhors class division, yet is best friends with a fluff-headed girl who exemplifies all Rosalind despises. The majority of the book is spent with the characters discussing the importance of propriety, while behaving improperly a good amount of the ti This book started off as a contradiction for me, and continued as such through the whole thing. The voice is middle grade, but the characters are all older teens, which makes this a YA novel. The main character is a feminist who values education and abhors class division, yet is best friends with a fluff-headed girl who exemplifies all Rosalind despises. The majority of the book is spent with the characters discussing the importance of propriety, while behaving improperly a good amount of the time. Rosalind waffles back and forth between using her respected family name and trying to hide it. Secrets were kept when they should have been revealed, and revealed when they should have been kept. The book is a murder mystery, but the murder doesn't happen until after the midpoint of the story, and it feels swept under the rug for a good chunk of the rest of the book. The description of the train itself was wonderful, and the setting quite alive, but the characters themselves were flat and impersonal. In the end, I liked not a single one of them, including Rosalind. And finally, while the first 90% of the book crawled at a snail's pace, the last 10% flew by in a blur of crosses and double crosses and face-offs. All in all, this just didn't connect for me. Oh man, this could've been an awesome steampunk adventure. A transcontinental train, Germany to America, that could travel underwater, fearless, flurry, stylish, modern debutantes, a murderer mystery, all great elements to the story. Plus this is so plainly written, no confounding talks of science and engineering, that its easy to get through. There's a lack of precedence, inconcistencies, and character depth. Somewhere in the translation of the concept into the story, an important spark ended up being lost. For although this is by no means a terrible book, it never really coalesced into a solid tale. Part steampunk, part historical, part murder mystery, it both was overwritten and underwritten in the wrong areas. Most problematic, though, is that the story was inert for about 3/4 of the book before finally picking up near the end. Story: American Rosalind is a parvenu - American new money in a London still holding on to old titles. Along with her aristocratic friend Cecily, she boards her father's latest triumph on its maiden voyage - the Transatlantic Express - an underwater train between Germany and the US. As she makes new friends, it is soon obvious that the shifting politics of Europe will greatly affect whether the train - and its passengers - reach US shores safely. The steampunk here is wondrous and fantastical - exactly what we would want in this genre. But the characters are simplistic, flat, and yes, somewhat cliche'd. Even for a middle grade read, they lack the complexity to keep readers intrigued. And nothing of import truly happens until our heroine *finally* boards the train after endless small talk, parties, and comparing of dresses and reticules. I read a lot of historical fiction and even I was bored by it all - it was just a pedantic examination of gilded age life, complete with suffragette sermonizing. The friendship between the characters was odd throughout. The reactions of Rosalind and Cecily to each other's actions changed constantly - Rosalind arrogantly dismissing her aristocratic friends for arrogantly dismissing her. Her reactions lacked genuineness and made her look simple. I would have put her age at 12 rather than the older teen and often I kept feeling that this was a man writing about women as a man perhaps sees them - inconsistent and inconstant. Because the characters and story were so underdeveloped, when the action finally happens, it is very ineffective. We should feel for these characters' deaths (and so should Rosalind) but that just doesn't happen. Certainly, we weren't given much reason to care for them. The end of the book was supposed to be a whirlwind of betrayals and twists. But they took so long coming and some were so suddenly introduced that it took away any emotion or impetus. It's difficult to explain but the only things really explored in this novel are the set pieces - and I didn't want to read a Steampunk novel about a great underwater train station. I wanted to follow the people IN that great underwater train station. There are chapter header illustrations but a lot of it is schematics for random electrical parts. There are some sketches of scenes from the book but I only saw rough versions, so I can't attest to how those will look. This is a fantastic, page-turning read. It is targeted at a young adult audience (12 and up), and I can say that the character development and intricacy of plot are appropriate for that age range. The story is fast-paced, and the mystery more complicated than I suspected as I was reading. Even as an adult reader, I loved this book. The story is just a good historical murder mystery, and the fact that it takes place on an underwater train progressing under the Atlantic lends a locked-room quality This is a fantastic, page-turning read. It is targeted at a young adult audience (12 and up), and I can say that the character development and intricacy of plot are appropriate for that age range. The story is fast-paced, and the mystery more complicated than I suspected as I was reading. Even as an adult reader, I loved this book. The story is just a good historical murder mystery, and the fact that it takes place on an underwater train progressing under the Atlantic lends a locked-room quality to it. There is nothing too deep or mature for early teen readers, and not so much history that it subtracts from what is simply a great story, but there is a lot that you can see in it as an adult reader that could be good discussion starters for teaching teens about the pre-World War time period. It's a good picture of class differences at that time - how servants and Old Money and New Money interact. There are also some underlying political and economical issues in the story that point toward the onset of World War I. The ending and revelations about the characters look like a good set up for a fantastic series. I think the revelations and motivations hint at some weighty issues about social and political ideas and the lengths that people will go to to promote their cause. There are no labels given to anyone's system of social beliefs in the book, and those are far from being the focus of the book, but again, adult readers will see hints at characters with communist leanings or democratic leanings, etc. Toward the end of the story, the reader is presented with the concept that joining forces with a potential enemy against a more immediate common enemy may be the best means to resolve an immediate problem. The cover is the best part with the idea of an underwater train a very close second. There are a lot of flaws with the story and characters which is mentioned in many of the other reviews. I think marketing this as a young adult book is a reach and would recommend it to older children instead of teens. Super quick read, mostly because I couldn't put it down. It's amazing in all senses of the word. I'm super excited to see what comes next. Super fun for fans of steampunk-ish things, as well as strong female leads. What if you were onboard the first ever underwater train, and there was a murderer on board? The year is 1908, and one American entrepreneur has disrupted the scene with a new fantastical machine: A train that can can the Atlantic. The entrepreneur sent his one daughter, Rosalind, to survey this trip, but her time becomes an adventure of love and lies she would never forget. But while on her adventure, the excitement came to a grinding halt: Her closest friend, Cecily, was murdered by another pa What if you were onboard the first ever underwater train, and there was a murderer on board? The year is 1908, and one American entrepreneur has disrupted the scene with a new fantastical machine: A train that can can the Atlantic. The entrepreneur sent his one daughter, Rosalind, to survey this trip, but her time becomes an adventure of love and lies she would never forget. But while on her adventure, the excitement came to a grinding halt: Her closest friend, Cecily, was murdered by another passenger. Everyone seemed to be against her, but Rosalind was determined to unravel the conspiracy. My original idea about this book before reading this was that it was “like Murder on the Orient Express, but underwater. What more could you ask for?”. While both Murder on the Orient Express and The Transatlantic Conspiracy share elements and certainly have the right to be compared as such, the latter is significantly worse and has a drastically different quality to its writing, plot, atmosphere, etc. And while my disappointment is certainly present in the score, this book is overall a mediocre and misleading due to the novel’s poor plot and pacing, mediocre characters, and a misleading setting. First, the misleading elements of this book. No, it is not a steampunk fantasy adventure. No, it is not a character-filled murder mystery with plot turns and red herrings at every moment. And no, that giant squid-octopus thing in front cover, the one that got me excited to read, it never shows up! NOT ONCE. In fact, the author, who is actually mainly known for writing steampunk and fantasy, barely ever mentions or uses the fact that the train is underwater during the trip.. While the author did insert a small and high quality amount of description in the setting, it does not make up for the lack of proper fantasy in what was supposed to be a steampunk adventure. You’d think that an author with such a background would be able to insert at least a sliver of fun fantasy elements in a murder mystery taking place in the first ever underwater train, but sadly, this is not the case. The plot takes no time to start being slow. Lets just say it takes roughly a quarter of the book for them to get on the train, and half the book for someone to get murdered. The last 40 pages are reserved for the second murder to occur. However, these last 40 pages are quick, action packed, and overall enjoyable. This inconsistent pacing is an immense problem for what could have been a great book. Characters are generic, with the main character being a “radical” suffragist, and her noble friends are all imperialists and are subordinate to the politics of Europe. While this is dull, I did like that they focused more on the clear ending of imperialism than just talking about noble to peasant relationships, like many in this genre do. The plot, characters, and pacing are all mediocre or poor, and my score shows that. This was a fun book with a cool concept. I enjoyed that it was a murder mystery. While I love shorter novels, this should have been a hundred more pages long with the second half getting more attention. The climax felt very rushed. Some of the characters deserved better development - especially Cecily. Really liked Rosalind and Alix. Overall fun and enjoyable. ***spoiler alart***Have you ever been stuck in a place with a murderer? The transatlantic conspiracy by G.D Falksen is a murder mystery where the main character, Rosalind Wallace, cannot trust anyone, including her closest friends or even her father. The events of this story take place during the 20th century in London where the first underground train was ever built. The novel explores the themes of betrayal, friendship, trust, and imperialism. The Transatlantic Conspiracy shows how one girl un ***spoiler alart***Have you ever been stuck in a place with a murderer? The transatlantic conspiracy by G.D Falksen is a murder mystery where the main character, Rosalind Wallace, cannot trust anyone, including her closest friends or even her father. The events of this story take place during the 20th century in London where the first underground train was ever built. The novel explores the themes of betrayal, friendship, trust, and imperialism. The Transatlantic Conspiracy shows how one girl uncovers the secret about her friends and family which will change her life forever. Rosalind Wallace’s vacation with her best friend Cecily is over when her father, an industrialist who made the first Transatlantic Express, calls her home. Luckily, Cecily and her brother, Charles, decide to accompany Rose. Rose meets Cecily’s school friend, Alix, and they all start spending time together. However, when Cecily is murdered, Rose and Alix could not stop grieving and know the murderer is still on the train. Now, Rose is suspicious that Alix could be the murderer. Will Rose survive on this train? G.D Falken’s “The Transatlantic Conspiracy” is an easy read. The book is a fast-paced whodunit and is written in colloquial language. I enjoyed the book as the story evokes suspense and is a page turner. The author keeps the novel from becoming boring by making the murder plot very mysterious. The story starts slow and is a bit boring, but becomes interesting as the novel progresses. The novel does not only contain villains but also introduces fun characters and romance to keep the readers entertained. I will recommend this book to my friends and family as a short, fun read. Throughout the book, G.D Falksen covers the topics of friendship and loss. Readers learn how to be careful about who they should trust. I highly recommend reading this book to all young adults as it will keep you guessing about the identity of the murderer. I would not recommend this book to adult readers as the language is quite simple and it might be easier for them to guess the plot. The Transatlantic Conspiracy is a captivating story with beautifully sculpted characters. Rosalind is the daughter of an inventor who has designed an underwater train and insists Rosalind take it for its first journey. Trouble is afoot from the beginning when her friend's brother vanishes before they board. A shocking murder will change the course of Rosalind's life, raising many questions that remain unanswered. This book will have readers clinging to every word, hoping to help solve the mystery. I had under the impression that G.D. Falksen's “The Transatlantic Conspiracy” fell under the category of Steampunk. After reading it – actually, early into it – I realized it was more like historical science fiction (think H.G. Wells or Jules Verne for style). The tale was set in 1908, and other than the main concept of an underwater transatlantic train (with a few underwater stations), it could simply be a pre-World War I historical novel. OK – so we cannot blame marketing of the product on the I had under the impression that G.D. Falksen's “The Transatlantic Conspiracy” fell under the category of Steampunk. After reading it – actually, early into it – I realized it was more like historical science fiction (think H.G. Wells or Jules Verne for style). The tale was set in 1908, and other than the main concept of an underwater transatlantic train (with a few underwater stations), it could simply be a pre-World War I historical novel. OK – so we cannot blame marketing of the product on the author, at least not for a work produced from one of the “traditional” publishing houses. However, the actual contents of the book fall upon the writer's shoulders. Take the supporting character of Cecily – it was never clear to me just WHY our main character Rosalind actually hung out with her! She spent a lot of time talking about her annoying habits and Continental (vs. American) attitudes towards class and caste. Look at the plot device of Cecily and her brother arranging last minute transport on the initial voyage of the transatlantic train – how, if this trip was so in-demand did they manage to secure first class accommodations at the last minute? And, just how did Rosalind manage to make it to her 18th birthday, given how trusting she is of everyone who makes her acquaintance?? I thought I would love this book, based on its description. As it turned out, I liked it – but only barely. One of the most well known mysteries of all time is The Murder on the Orient Express. A who-done-it that takes place on a train. Mr Falksen takes on that topic in his new teen novel. This book takes a classic case of murder and gives it a steampunk twist. For they do not travel on an ordinary train, but rather one that connects Germany to America on underwater tracks. The scientist in me wants to know how many of the things in this book can happen, but for the sake of enjoyment, suspend your sci One of the most well known mysteries of all time is The Murder on the Orient Express. A who-done-it that takes place on a train. Mr Falksen takes on that topic in his new teen novel. This book takes a classic case of murder and gives it a steampunk twist. For they do not travel on an ordinary train, but rather one that connects Germany to America on underwater tracks. The scientist in me wants to know how many of the things in this book can happen, but for the sake of enjoyment, suspend your scientific thought. Rose is the creator's daughter, and is being sent on the inarguable journey as a symbol to everyone, that this new train is safe. That is until people start dying. The mystery part is okay, but very slow. The reader spends 75% of the book on the build up to the end, and then the end passes way too quickly. No enough dead people and not enough information on the purpose of their death. That is why I’m pretty sure that there will be a sequel. Note: ARC received via Amazon Vine in exchange for review. The only conspiracy about The Transatlantic Conspiracy is how this was sent to print in its current state. The first half of the book is overly preoccupied with creating character and inane conversation (for which we're told there's a point very curtly in the second half). The characters feel like sketches along with a plot that feels overly familiar. This seems to be marketed as a young adult steampunk romp but reads more like a juvenile Note: ARC received via Amazon Vine in exchange for review. 2/3 stars. This is labelled as a YA book, but it reads like middle school fiction. I agree with the other reviewers, this could've been great fun about a daring young woman, but it fell a bit flat with everything and the kitchen sink thrown in as well as a rushed conclusion that sets itself up for a sequel. A steampunk luxury train underwater with an octopus on the cover? Of course I'm going to love it. I would have liked it a little better if it were longer and written for teens instead of middle grade. The world building takes the whole first half of the book and the murder doesn't happen until after that, which is fine by me. World building is my favorite part. This book is ok, it wasn't near what I had hoped for it. This book had tons of potential , and honestly I don't feel that it was used. It was well over halfway through before anything really happened beyond them riding in a train. The story seemed to naturally flow and the author made it interesting , and I feel that it was well written, just a little anti-climactic. This book was just silly and unbelievable, with no backbone to back up the claims in the plot. What I liked: The all too brief descriptions of the train, and the underwater environment in which it traveled. All the different cars made me want to be on that train for one trip just to explore. Also, the idea of travelling on a train, underwater, where you would have the ability to look out the window at the ocean just sounds like my idea of a fantastic journey. What I did not like: Lets star with R This book was just silly and unbelievable, with no backbone to back up the claims in the plot. What I did not like: Lets star with Rose, Cecily and Alix. Rose is the daughter of the man who built the train. She is a young lady who loves to drive motor cars and seems, in better plot moments, to be a smart girl. She is also a suffragette, which I admired. She does what she likes with little regard for how society views her which I thought was brave. However, she also has the oblivious, whinny streak in her. Cecily is Rose's friend, a wealthy Lady and her and her brother Charles accompany Rose on the trains voyage as chaperones. Cecily, for all of the book that she is alive is more concerned about fashion and gossip and what people are wearing. She is portrayed as extremely flighty, dumb, and only concerned about looks and gossip. Without giving anything away, suddenly at the end of the book we are supposed to believe that this girly, egotistical, silly girl is supposed to be this extremely brilliant young woman. Can you say 'unbelievable' and 'a really dumb plot twist' because that is exactly what I felt when I read it. Alix is a similar case. She is shown in a similar light to Cecily, then suddenly we are meant to just swallow that she is brave and strong and smart. Charles is a similar case. We see him briefly in the beginning, he disappears for 80% of the book, and reappears again ten pages or so before the end, and we are meant to believe he is the linchpin in this entire story, and he has some grand plan with regards to serving King and country. This book is definitely marketed and geared for young teens and older children, but that didn't stop me from enjoying it. (First the negative, then the positive). What really marks it out for that age group is the fast action-driven pace and the shallowness of most characters. The plot takes a major twist in the very last chapters that is so out of the blue it just seems contrived. Obviously there needed to be a conspiracy involved but what occurred was far larger than I expected and was an obvi This book is definitely marketed and geared for young teens and older children, but that didn't stop me from enjoying it. (First the negative, then the positive). What really marks it out for that age group is the fast action-driven pace and the shallowness of most characters. The plot takes a major twist in the very last chapters that is so out of the blue it just seems contrived. Obviously there needed to be a conspiracy involved but what occurred was far larger than I expected and was an obvious setup for a series continuation. But since the twist was introduced so quickly and at the very end of the book, there was no explanation or reasoning for the characters' motivations, which leaves me questioning them, but not enough that I plan to continue with the series. If I had known it was a series I would never have picked it up but that is a personal thing. The only reason this is getting two stars instead of one is because I like the idea of an underwater train. That's it. The rest is tragic. Rosalind, the main character, is almost completely unlikable. For all she claim to hate elitism, she sure participates in it a whole lot. She's sullen, has incomprehensible emotions that are never explained, and doesn't seem to do anything else but complain about the people who are supposedly her friends. There's a great deal of pacing issues in this book. For The only reason this is getting two stars instead of one is because I like the idea of an underwater train. That's it. The rest is tragic. There's a great deal of pacing issues in this book. For the first half of this book, absolutely nothing happens and I was left waiting to see if I had read the book jacket wrong and if there was going to be a murder at all. Not a whole lot happens after the murder either until the last twenty or so pages, where the author tries to shoehorn in an entirely new plot and make his characters three-dimensional with bizarre motives and newfound skills that have never been hinted at before. There are other strange actions characters take without ever being explained. Words fail when I try to express the depth of disappointment this book caused. I am a fan of G. D. Falksen, and looked forward to this book's release, but the finished product is riddled with amateur flaws. On the positives: The cover is beautiful. The concept is fine. The text is clean. The author's grasp on the steampunk genre is clear, but not on the target audience. The mc is a teen, the writing style is middle grade or less, the murder mystery, NA or adult. I wonder, too, where the editors Words fail when I try to express the depth of disappointment this book caused. I am a fan of G. D. Falksen, and looked forward to this book's release, but the finished product is riddled with amateur flaws. I wonder, too, where the editors were in this process. The first 100 plus pages of this 240-page book have little to do with mystery, adventure, or plot. I expected, perhaps, that the dreary details of the social niceties were cleverly concealing clues. Sadly, this was not the case. They bear little import. I thought perhaps those pages would be dedicated to world-building, but there is hardly any difference between historical society and the one presented in this version of London. The biggest difference is the MC's fondness for every unfashionable cause: from suffrage to anti-imperialism, her pontificating made her seem all the more shallow as she never takes action. The plot heats up in the last few chapters. Unfortunately, all the pieces come together in a few lines during a chase scene which completely destroys the tension. The reader hasn't time for any "aha" moments because the storyline is rushing them forward. The writing consistently tells rather than shows and lacks voice. The most sparkling moments are when the text describes the architecture. The characters are shallow and stereotypical. The heroine's revelation is anti-climactic. Even the illustrations were lacking. The characters all looked the same and there was an absence of detail which steampunk demands. This book had a really interesting premise, and likable enough characters, but it kind of felt lacking too. Like, this was a lot of plot to cram into a 220 page book, especially when most of it was taken up with the girls talking about gossip and fashion and propriety. Like probably not even half this book was the actual plot which made the parts that were about the mystery plot seem rushed and with the more shocking things like a slap in the face. Plus there was a lot of pushing the suffragist This book had a really interesting premise, and likable enough characters, but it kind of felt lacking too. Like, this was a lot of plot to cram into a 220 page book, especially when most of it was taken up with the girls talking about gossip and fashion and propriety. Like probably not even half this book was the actual plot which made the parts that were about the mystery plot seem rushed and with the more shocking things like a slap in the face. Plus there was a lot of pushing the suffragist mentality. And all the men in this book, even the ones you were supposed to like came across dumb or silly or incapable of doing much of anything. (Doubly odd as this was written by a man). Also, is this supposed to be a series or something, because it ends rather abruptly. Really, this book would have been a really good story if about twice as long and with more fleshing out of the characters. It just felt very amateur in the writing style to me, and to my knowledge this isn't even a debut author. A mess of a book. The plot is poorly thought out and executed. The settings are good but the author makes no use of them. The book feels thrown together and clunky, and I wonder if an overzealous editor was at work here - the sudden and badly written ending doesn’t fit to what came before. Note to author and proofreader - ‚brakes‘ stop vehicles, not ‚breaks‘. Basic stuff, people. A lot of telling rather than showing with minimal plausibility here. The pacing is off and although a culprit is pinned, there is no backstory as to how their actions could have been pulled off. The illustrations are few are far between and don't add anything to the story. It took a long time for anything to happen, and nearly halfway through the book before the "mystery" portion of things really kicked off. The world seems interesting, but not enough to keep me engaged, alas. I did not enjoy this book. The premise of the book had so much potential. But the characters were poorly developed. Everything felt rushed. But it took forever to get to the meat of the story. Once you finally got to the story, it was disappointing. Disappointing all around. This was a fine "intro to Steampunk" I guess, for young readers. For me, not enough meat. At all. The storyline was too simple, the technology and world not explained enough for me. I got tired of it, and it was really short and easy to read. Still looking for steampunk I can fall in love with.